I found a bunch of Pat Pend LEGO in a thrift shop. Among all the goodies there are two black smooth 2x4 bricks with train wheels attached to them. On one of the long sides there is a half moon like cut-out with a sort of flat hook thing. 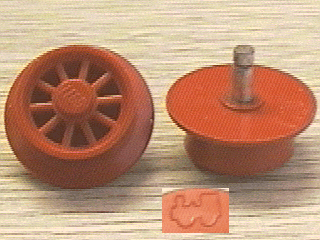 On the short sides there are detachable train wheels with ten spokes. The wheel axles are made of yellow brass. The logo on top is the old LEGO logo with the letter "O" being open. The logo is quite large. 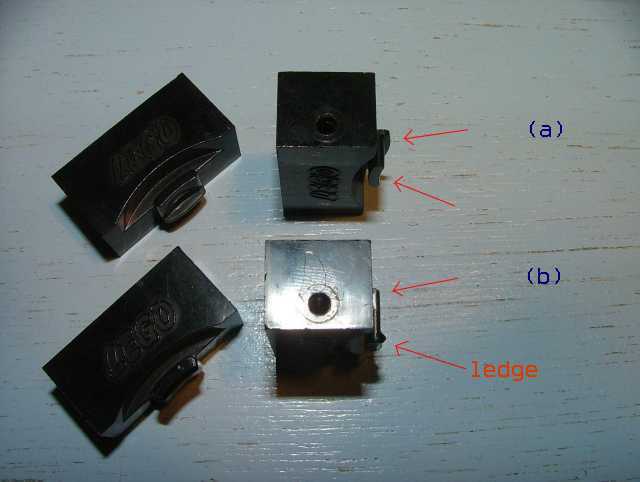 Can anyone help me identify these parts? Hey, there Happy Dog! These train pieces? Part #BB37 - Train Brick 2 x 4 x 1 1/3 Sliding Block with Wheels Holder. Part #Wheel2A - Wheel Spoked for Motor. Together they appear in these LEGO sets. Not the answer you're looking for? Browse other questions tagged part-identification trains wheel discontinued or ask your own question. How do the train wheels turn so smoothly? Can you identify these curved grey parts?